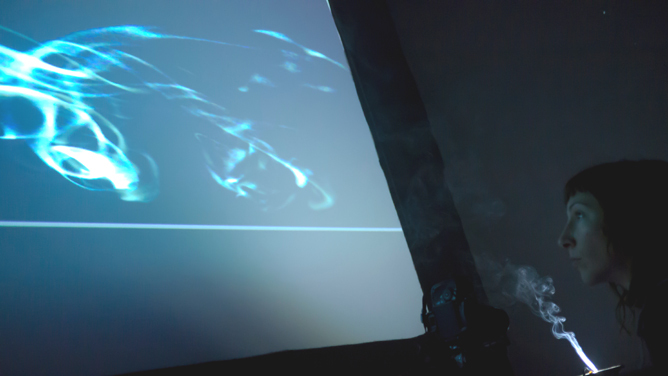 With a particular interest in the lower senses (smell, taste and touch), not only on their aesthetic potential, but als on their implication in politics, gender and perception, Yolanda´s work is an amalgam of elements from sound art, visual arts, inspiration from science and techniques from new media-art. It materialises in installations and performances for multi sensory immersive experiences, that have been presented at festivals like Sonic Acts (NL), WRO Media-Art Biennale (PL), Kontraste (AU), STRP (NL), SPARK (USA), Todays Art (NL), Oddstream (NL), Transmediale (GR) etc. She is a core member of the iii collective, an artist-run platform supporting radical interdisciplinary practices engaging with image, sound, space and the body. Her silent video 'Dislocated Sun', which is presented during (h)ear 10 year festival, is part of a full show, 'Dislocated Frames', that explores ways of presenting its elements in a different location than the usual. Ze is een kernlid van het iii collectief, een door kunstenaars gerund platform dat radicale interdisciplinaire acties ondersteunt en zich bezighoudt met beeld, geluid, ruimte en het lichaam. De geluidsloze video 'Dislocated Sun' die getoond wordt tijdens (h)ear 10 year festival, maakt deel uit van een volledige show, 'Dislocated Frames', waarin wordt onderzocht hoe elementen op een andere locatie te presenteren dan gebruikelijk.